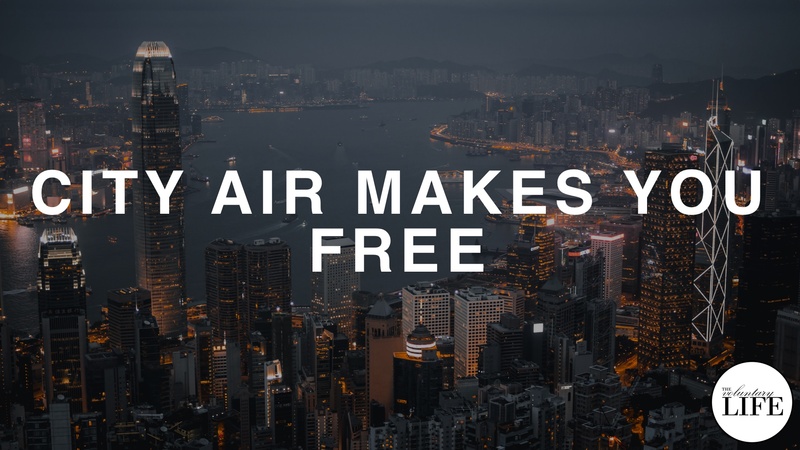 The idea that 'City Air Makes You Free' (expressed by writers such as Jane Jacobs): finding freedom in the division of labour and diversity that cities provide. Arguably, the benefits of self-sufficiency have been overestimated in books like Walden and Atlas Shrugged, whereas the benefits of interdependence in cities have been under-appreciated by previous writers on liberty. It is suggested that Galt's Gulch wouldn't actually work in real life because it would lack the division of labour of a big city that is necessary to support the kind of advanced and specialised roles of it's inhabitants. In contrast, living in a city can provide many opportunities for greater work and personal freedom because of the benefits of the division of labour in cities.